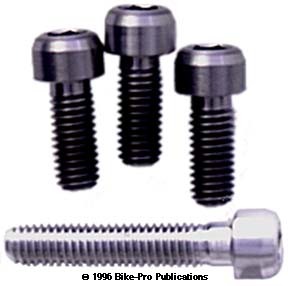 Specialty Racing Products has made it's reputation in the design and distribution of Titanium replacement bolts for bicycle specific applications. These bolts are made from Titanium 6-4, which is to say that the Titanium alloy used in these bolts is comprised of 90% Titanium, 6% Aluminum and 4% Vanadium. 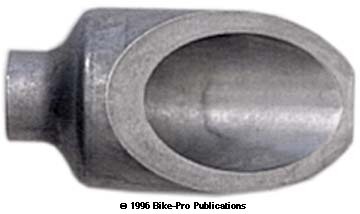 Since most bike parts are made from Titanium 3-2.5, not 6-4, you should know why. Fundamentally, though Ti 6-4 is used widely in the aerospace industry, it isn't commercially available in tubing form, but it is available as rod, or in billet and ingot form. Ti 6-4 is better suited to making bolts, because it has a higher tensile and yield strength than Ti 3-2.5. Tests measuring the two alloys show their differences. In the annealed state, Ti 3-2.5 has an Ultimate Tensile Strength of 94,000 pounds per square inch, while Ti 6-4 runs up to 134,000 psi. Yield Strength Comparisons, in the annealed state, show Ti 3-2.5 will yield at 84,000 PSI, while Ti 6-4 runs all the way out to 126,000 PSI. 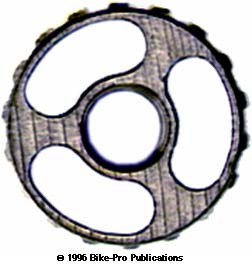 Because of this, Ti 6-4 may not exhibit the modest type of flex required of bicycle parts for even the slightest shock dampening. Again, Ti 6-4 is not commercially available in tubing form. The bolts are measured in millimeters from the top of the "shank", which is just below the head, to the bottom of the threads. The threads on all SRP bolts are cold rolled into the bolt, rather than cut. These are the reasons that a rolled thread is preferred. Cutting of threads actually leads to a weaker bolt, because more material is removed, to a deeper depth, than rolling threads into the side of the piece. In rolling threads, the material displaced from the trough portion of the thread, is pressure shaped into the thread peak. Because of the sharpness of the tool used to cut a thread to the proper depth, the "base" of the thread is narrower, rolled threads produce a thread base that is broader, giving the thread more foundation to grip by. Lastly cutting threads produces burrs on the threaded material, that make installing the bolt more difficult. Bolts are described as have a thread and pitch. The thread is measured as the outer diameter of the threaded area, and the pitch is how far apart the peak of each thread is from the next. For example, an 8mm by 1.25 thread pitch bolt, has threads that measure outer-outer of 8 millimeters, the distance between each thread, on center 1.25 millimeters. SRP makes Titanium stem expander bolts in several lengths, of Titanium Ti 6-4 alloy. Each of these bolts is turned on a lathe to reduce the rod stock to the dimensions required for head and shank of the bolt. 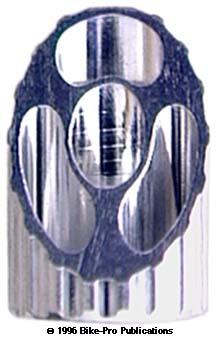 The head, which has 12.7mm outer diameter, is drilled for the hex head (allen), then "broached", which is the punching of the 6mm hex shape into the head, then the threads are rolled onto the shank. The expander bolt has 8mm threads with a 1.25mm thread pitch. They come in four lengths, (top of shank to bottom of threads), 70mm, (for Control stems), 90mm (for the Zoom stem), 135mm, and 143mm which most of the remaning stems. Replacements should not be any shorter than the useful length your stem requires. They may be longer, but not shorter. The 70mm bolt weighs 16 grams, the 90mm weighs 19 1/2 grams, the 130mm weighs 27 grams, and the 143mm weighs 29 grams. The expander bolt for the Ritchey Force Comp Road stem, made by Nitto doesn't follwo conventionality in theading, by using a 8mm diameter shank, nor does it adopt the 7mm shank used in the Ritchey Taiwan stems. Instead it uses a 6mm x 1mm pitched thread on a bolt that is 129mm long. The SRP exact replacement weighs 14 grams. The 1A and XA expander bolt is rather unique. It is 135mm long with 7mm x 1mm thread pitch. The head is 12mm in diameter, with a 9.5mm height to recess flush into the stem. This SRP bolt is an exact replica of Ti 6Al-4V and has a weight of 25 grams. SRP recognized that some XA owners may want to change their steel binder bolt to Titanium, this is that bolt. The rod is turned to the proper dimensions for head and shank. The head is drilled and broached, making a 6mm hex head, then the threads are rolled onto it. The outer diameter of the head is 12.8mm. The bolt has 8mm threads by 1.25mm thread pitch. The bolt is 20mm long and weighs 7 grams, nearly half the weight of the steel original. In many instances people want to replace their steel binder bolts with Titanium ones, these bolts make that possible. They are made like the other SRP bolts, machined, with rolled threads of lightweight Ti 6-4 Titanium alloy. These bolts have a 5mm hex head with 6mm threads by 1mm thread pitch. The outer diameter of the head is 9.6mm. They come in three lengths, 20mm, 33mm, and 45mm. The 20mm length weighs 3 grams, the 33mm bolt weighs just under 5 grams, while the 45mm bolt weighs 6 grams. These also fit other parts like brakes and seatposts. These are really the long version of SRP Titanium water bottle cage bolts, but they fit perfectly as replacement binder bolts for the IRD Macaroni and Ricky Racer stems. They are made of Ti 6-4 Titanium rod, which is turned to the proper dimension for the head and shank, the head is drilled then broached with a 4mm hex head. The threads on these are rolled. The outer diameter of the head is 8.3mm. The bolt has 5mm threads by .8mm thread pitch and is 18mm long. Each bolt weighs 2 grams. Sold individually. The Z-Bolt is made of a new alloy, that is 50% aluminum with lesser amounts of Zinc, Manganese, Titanium and Copper. The alloy was developed for use as a fastener only because it has a far greater shear strength than other metal alloys. It is a chief material for the fasteners used in the Space Shuttle program. Zicral is reported to have a strength to weight ratio two times that of Titanium, and three times that of Cro-moly steel. The Zicral rod is made in Italy, which Syncros turns to shape, then drills and broaches for the 6mm allen head. The threads are cold rolled into the shank. Syncros chose to depart the industry by using 8mm threads by a 1.0mm thread pitch, which makes a finer thread. The Z-Bolt comes with a thin brass washer, to reduce the friction between the bolt and stem at installation. The aluminum wedge is extruded, with machine work to cut and thread the piece. The wedge extrusion, un-like the standard wedge pieces which are solid, this wedge has three near third circumference slots which reduce the weight of the 1" diameter by 5 grams (14 1/2 grams on the 1 1/4") from the solid variety. Because of the thread pitch you must use the Syncros wedge only. The wedge is available with the bolt to fit 1", 1 1/8" or 1 1/4" stems. The Z-Bolt expander bolt is made only in a 133mm length. The Z-Bolt, washer and wedge, (a must for this bolt) in the 1" diameter weigh 30 grams. IRD has created a solution to several potential problems. Among them are buying a new frame, and wanting to use your old smaller diameter quill in a new oversize steerer tube. Another is that you like the styling and weight of a stem that isn't made in the oversize diameter your frame requires. This stem shim resolves these conundrums, by sliding over the present quill and wedge assembly you have now, and adding thickness to it, so it fits rigidly and securely in the larger steerer tube. This is a very basic device, made of aluminum tubing, that is cut to length, then sawn lengthwise so the piece will expand and grip the inside of the steerer tube. They are made in two diameters, one takes the standard 1" size, (22.2mm) up to a 1 1/8" diameter, (25.4mm). The other takes the standard 1" size and brings it up to the 1 1/4" diameter, (28.6mm). The tubes are 2 3/4" long. The 1" to 1 1/8" size weighs 21 grams, while the 1" to 1 1/4" size weighs 49 grams, (the walls are thicker). 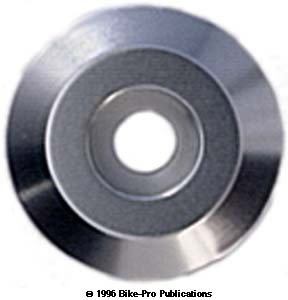 Throughout the writing of this section we have continually described some of the wedges used in many of the stems as being "extruded, then machined aluminum" or in some cases possibly "cast, then lightly machined aluminum". In these cases what have really been describing is a wedge made by Hsin Lung, (yes, the Zoom people). Hsin Lung makes the wedge that most, even small stem making concerns import and use for cost and expedience reasons. The Hsin Lung wedges, however are sometimes weighty. Brodie makes a cast magnesium wedge in two sizes that are as hollow as wedges can safely be made. The Brodie wedge comes in two diameters 1" or 1 1/8". Each is tapped with 8mm x 1.25mm pitch threads. The Hsin Lung 1" diameter wedge weighs 14 grams, while the Brodie 1" weighs 9.5 grams. The Hsin Lung 1 1/8" diameter wedge weighs 20.5 grams, while the Brodie 1 1/8" weighs 12.5 grams. This may be a practical and inexpensive way to knock weight off your bike, considering there are far more expensive techniques employed commonly. Some new bikes and some inexpensive headsets for use with threadless fork steerer tubes come with a plastic upper cap. The cap is used to cover the opening on the stem, the Star Fangled Nut, the open steerer, and hold the stem in place while it's being tightened down. While the plastic cap is lighter, having a machined from aluminum rod metal cap has a certain esthetic pleasure and durabilty. The Aheadset cap bolt is the same for all Aheadsets, with a 9.5mm in diameter head that is 6mm tall and a 6mm diameter shank. These caps recess the bolt head and have a 6.33mm diameter shank exit hole. The aluminum caps are available in three diameters 1", 1 1/8" or 1 1/4", in Black, Lavender, or Silver. The weight of the 1" is 10.5 grams, the 1 1/8" weighs 13.5 grams, the 1 1/4" weighs 14.5 grams.